Mr Patrick Green and Judge discussing October’s trial. PG apologises for documents going to the wrong place. J says a couple of years in and he’s sure the documents will go where they should eventually. Just a note - nothing in these tweets is a direct quote unless it is in direct quotes. These tweets are paraphrases and summaries of what is going on. And they will be infrequent as I try to pull out the nuggets from the legal to-ing and fro-ing. 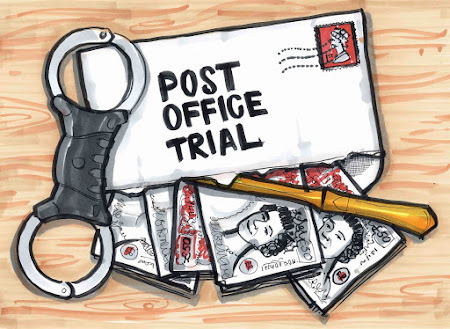 If you want to know why I am in court, do have a look at postofficetrial.com - it has the whole story. October’s trial might not be October’s trial at this rate… it could be December. The third trial (previously known as October’s trial) doesn’t yet have a name. It was being called the “Breach” trial during the Common Issues trial. Mr David Cavender QC for the Post Office on his feet. Argument is about how many lead cases the third trial should have as well as the number of experts and the date. There are at least three journalists in court, which must be some sort of record for a CMC. I did warn them. Everyone agreed on this. Ideas for how to resolve it not yet aired. PO QC: this is what happens in any group litigation. J: It’s what’s happening in THIS litigation. The claimants proposed solution is to try more issues in third trial rather than individual cases. PO QC calls this “not very well thought through"
We are already one journalist down. J: "I consider a round three trial in the autumn of 2019 not only to be a good idea, but to be essential." J also says a 5 week trial (as opposed to a 10 week trial) is the best balance between cost, effectiveness and resolution. So we’re going to have a 5 week trial in the autumn. But we are no nearer to what its content will be than we were in December. So how is judge going to move this forward? J rejects PO’s argument that third trial should be of two individual claimants. It will instead be (subject to informed debate between the parties) on a group of issues. Claimants very keen to get alleged issues of deceit, concealment and fraud by PO into the third trial. J notes no agreement about what third trial involves or which claimants should be involved. today’s CMC was meant to be all about third trial and yet there’s no agreement between the parties at all about what form it should take…. … However J has now decided it will be on a group of issues. J so you want third trial to happen in the autumn and you want it to be around other issues not yet agreed to maximum resolution, and you want to spend the next 7 days discussing what those issues are and if you can’t agree you come back to me? J turns to PO QC. DC: My lord I think it is a terrible idea. J going through PO plan. Resolving 2 cases in trial three, then 16 cases in trial 4 in 2020. Judge’s tone suggests he is not happy with this proposal. J Suggests this means no resolution for the first claimants till 2020. PO QC says J's got low expectations of what might come out of third trial. It will inform many other claimants’ cases. J I think is pushing for a re-run of first trial format except with different issues and potentially new lead claimants. J about to make an order. Third trial (now called R3) scheduled for 8 Oct. J wonders if this is too soon given we appear to be starting from scratch. PG asks for November start. Third trial will start on 4 November and last for four weeks. That is now an order. Finally. J: you must agree a list of issues to be identified in R3 and whether there are issues of fact involved and therefore how many lead claimants needed. If you can’t agree I need a list from both of you and I will make a decision. J also orders the two QCs to meet and actually spend some time together to try to resolve their issues. PG QC: We are quite good at that now. PO QC asking judge to order a proposals list of lead claimants for R3 and set up a selection process for those claimants. And that that selection criteria process should start now. J you will agree list of issues in R3, which of the existing lead claimants can be used in R3 and..
… if there are any new lead claimants to be added the selection criteria for choosing the new lead claimants. J turns to judgment of Common Issues trial. … AT LEAST before the last day in Feb.
J has asked that both the Post Office and claimants liaise transparently with the press to ensure all parties are aware of the date the judgment will be handed down as soon as it is known. Both QCs agree. Judge rises. CMC over. Alan Bates, head of the JFSA has just walked over to me. He’s asked that I let people know that the two conferences he was planning to hold with claimants in Feb will now be postponed until the judgment has been handed down. Full write-up will be on the blog postofficetrial.com as soon as I can.